It is as a member of the longstanding tradition of French organist-composers that Alexandre Boëly is best remembered. By comparison, his piano music is as good as unknown, even though it forms an important link between the Baroque and Classical worlds of eighteenth-century France, and the emerging Romanticism of the century to come. This first volume of his piano music seeks to highlight both elements, and thereby present Boëly as a forerunner of the likes of Saint-Saëns, whom he taught, as well as other pioneers of the instrument such as Alkan, Chopin, and Liszt, all of whom Boëly may well have known personally in Paris. As an introduction to his extensive piano output, this first volume is very generous, includes more than enough to whet the listener’s appetite further, and has really extensive sleeve-notes (English only), complete with musical examples, all provided by Australian pianist Stephanie McCallum, who uses an Érard piano from 1853 for her really most impressive performances. The CD opens with the First Suite of his Op 20 pieces, which includes some of his earliest work, written while still a teenager. Given that these pieces were drawn from separate periods of his composing output, there isn’t really any overall structured pattern to be seen. The opening Allegro moderato in A minor is written in Classical minuet and trio form, but the overall feel is more of an extended Chopin Mazurka than a more trite Haydn Minuet, especially in the outer sections – certainly captivating as an opening gambit, as, indeed are the first four items individually, particularly the Ländler-like No 4, which clearly looks towards Weber. No 5, meanwhile, looks back to the world of Bach and the first Prelude from his ‘48’ Book 1, while No 7 (Romance) is particularly attractive. Quite often the minor tonalities draw more from the composer’s invention, while also helping to provide contrast and variety in quite long sets of miniatures. If it is possible to order these pieces in any way, it would seem that the ‘final’ group begins with the No 10 Prélude (Andante) which recalls the Bach-style of Prelude No 5, but here there is noticeably a more ‘romantic’ feel to the writing and harmony. Between the two Suites, Op 20, McCallum includes an example of Boëly’s somewhat unusual penchant for contrapuntal music in the style of Bach, and with Baroque-style suites – possibly an outcome of his other career as organist-composer. His Suite IV in F minor opens with what Boëly calls “a rather long fugue” on two subjects. This is followed by a tranquil Largo in the relative major (A flat), and ends with an entertaining, and decidedly-catchy Polacca. Then comes the remainder of the 24 Pièces diverses pour piano by way of the Second Suite. Generally-speaking the pieces here are a tad more extended than those of the First one, though they can again be roughly grouped into three sets of four. McCallum’s highly-informative and erudite sleeve-notes again add a great deal of information to the music heard, especially with the added bonus of some printed musical examples. Otherwise, the Second Suite picks up from where the first one left off, and again is full of variety, both stylistically, and in terms of tonality, while clearly evidencing a distinct move forward in Boëly’s prowess as a composer for the instrument. The Caprice pour le piano, which follows, was published by the composer himself at some time between 1830 and 1842, and then brought out commercially in 1843. Such pieces as this were popular at the time, given the polished technique often needed to bring such salon-pieces off in performance. In Boëly’s example here, there is a real sense of fun, enhanced by some charmingly light-hearted filigree passage-work along the way. On this occasion, it’s really the figure of Schubert standing in the wings that appears to be powering much of the composer’s invention and lyricism, as well as master-minding one or two of the enharmonic modulations of which the Austrian composer was such a past-master, enabling Boëly to make some really adventurous key changes within sections and movements. 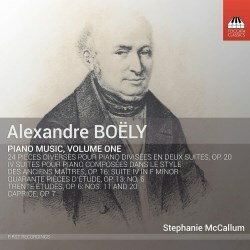 This new CD of Boëly’s piano music ends with three studies that come from two different collections of études. Boëly’s studies don’t seek to mimic or develop the real pianistic innovations seen in those by Chopin and Liszt, but are, instead, dedicated to two other composers, whose various sets of studies align themselves more with conservative and more traditional pianism – Friedrich Kalkbrenner, and Johann Baptist Cramer. Indeed, according to McCallum, the first two studies, No 11 in E minor, and No 20 in C minor from the Op 6 set, show a distinct preoccupation with finger-work typical of Kalkbrenner. The former also makes use of a feature seen in many of Alkan’s studies, where difficult double-notes are played in each hand, and then with both in combination. Here the touch and tonal warmth of the Érard piano afford significantly greater clarity to such otherwise dense textures, than would be the case on a conventional full-size concert-grand of today. The final study – No 6 in E flat minor – comes from the larger Op 13 set, and yes, while it doesn’t really approach anything that Chopin or Liszt produced, it is still decidedly challenging, in terms of the left hand, and leaps throughout, and provides a real bravura finish to the CD. Hitherto unknown composers now seem to be unearthed almost every week, and Toccata Classics is certainly one of the pack leaders – if not, in fact, the current leader of the pack, something for which we should all feel immensely grateful. Inevitably, of course, there will also be the odd occasion when letting a sleeping dog lie might just be the most humane solution. However, Toccata Classics rarely, if ever, get this wrong, and by deciding to investigate a different, yet equally vibrant facet of Alexandre Boëly’s musical output, while they might not have quite struck gold, there is surely a great deal of other precious metals waiting to be uncovered in his pianistic output. This can only be really good news for music-lovers, serious students of the period, or the piano, or just those who thought he was a typical organist and theoretician, with his head in the past. The excellence of the playing, the fidelity of the recording and perfect piano sound, to say nothing of the erudition of the sleeve notes, all make this CD hard to resist. And then you’ll more than likely become hooked, just in time for the release of Volume Two.